Located on Berkeley Street, this chic Mayfair Italian restaurant is another (not-so) little gem that I recently had the pleasure of discovering. Stepping through the main entrance, Bocconcino is actually much larger than it appears to be from the outside. Spread across two floors, there is a livelier dining/bar area downstairs, and the more intimate room at the end of the corridor where we were shown to our table. They are known to serve both classic and modern Italian cuisine using only the freshest of ingredients, served alongside a wide selection of exclusively Italian wines. The starters all sounded really good, but we managed to narrow them down to a few that were recommended to us by our waitress. The first one that caught my eye was the scallops, which were juicy and nicely seared, served with a creamy cauliflower purée and bottarga (a delicacy of salted, cured fish roe) – a strong start to the meal. We also had the classic favourite of deep fried calamari, coated in a light, crisp batter and served with tartare sauce. Torn between the pan-fried dover sole and the pasta dishes, I eventually settled for the linguini with Scottish lobster and cherry tomatoes. The pasta was cooked al dente which is how I like it, mixed in the delicious tomato-based sauce with generous chunks of lobster – a dish that definitely did not disappoint. That must have been the biggest portion of Veal Milanese that I have seen, it was a struggle to finish it, even between the both of us. Juicy, tender meat coated in a crunchy golden crust – if you love your meat, then this might the ideal choice for you. By this point of the meal, as much as I love my desserts, I was happy to share one (!) dessert between the two of us. 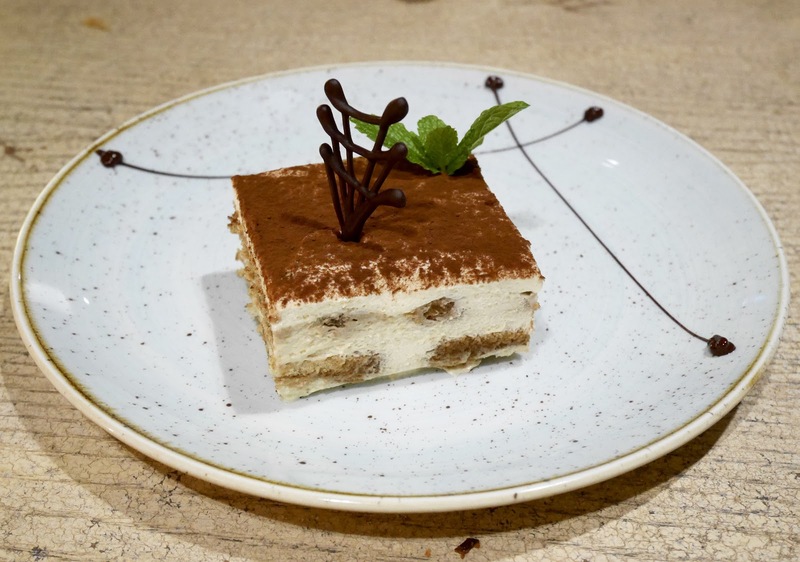 We went for the classic tiramisu which had a light and fluffy texture, with lovely hints of coffee and cocoa. We were however later coaxed into ordering the profiteroles with Chantilly cream and hot chocolate sauce, which is one of their signature desserts – we gave in rather easily (how could I say no to more dessert? ), which was a satisfying end to our meal.